The Anglo-Dutch oil firm Royal Dutch Shell has reported annual profits of $27.56bn (£13.9bn), a record for a UK-listed company. Much of the rise in profits has been attributed to rising oil prices, which currently stand at about $91 a barrel compared with $57 this time last year. But there is concern among analysts that Shell has delayed publishing figures showing its oil reserves. Profits, measured by current cost of supply, beat a 2006 record of £12.9bn. The oil reserves figure, which shows whether Shell found enough oil in the ground to replace the amount it was taking out, will not be published until the spring. "The market really has taken this to imply that the figures aren't going to be great," said Nick MacGregor, an oil analyst from Redmayne Bentley. "If they were that good Shell would be telling the world about it now." Shell shares, which edged 0.1% higher on Thursday, are listed in the UK and the Netherlands, while the company's headquarters are in The Hague. 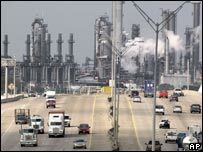 It reports its profits figures in dollars because oil is priced in the US currency. In dollar terms its earnings are up 9% on the previous year. It has set its dividend at $0.36 per share for the last three months of 2007, which is up 11% on the same period of 2006. 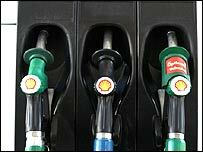 "Overall these are satisfactory results," said Shell's chief executive Jeroen van der Veer. "We made good progress in 2007, launched new projects upstream and downstream, and achieved exploration successes." Some unions have objected to the level of Shell's profits at a time when consumers and businesses are having to cope with the effects of high oil prices. Unite's joint general secretary Tony Woodley described the level of profits in the oil industry as, "quite frankly obscene". "Shell shareholders are doing very nicely whilst the rest of us, the stakeholders, are paying the price and struggling." Mr Woodley is calling for a windfall tax on oil companies similar to the one imposed on privatised utilities when the Labour government came to power. The oil companies have stressed that little of their profits come from petrol forecourts, with the majority of the price paid at the pump already going straight to the government. Additional taxes on their UK operations have already been imposed, with special taxes on the revenue they make extracting oil and gas from the North Sea.